So, there are chocolate chip cookies, then there are these chocolate chip cookies. Throw away your other recipes, because you won’t need them after trying this one. Seriously. This is the best chocolate chip cookie I have ever made, and my coworkers seem to agree. After bringing them into work, I received an email from one of my favorite guinea pigs which said, “OMG, those cookies are good!” in 72-inch purple and pink font. Point taken. These cookies are crispy on the outside, chewy on the inside, have a rich caramely flavor because of the brown sugar, and the sea salt sprinkled on top is just the perfect addition. And even though they are the size of your head, you still get chocolate in every bite thanks to the fèves (chocolate discs). Because I’m not a fan of dark chocolate (and not ashamed to admit so), I used milk chocolate ones, which I found at Surfas, my local commercial kitchen supply store. (Just search fèves on their website.) These specific chocolates are kinda pricey, so you could always just use the largest chocolate chips you can find and they will still taste just as good. And finally, just a note that I used all-purpose flour in place of the bread flour. 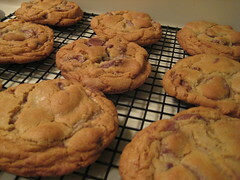 Yields 1 1/2 dozen 5-inch cookies. Recipe from The New York Times, via Smitten Kitchen. I wished I worked in your office, or vice versa. Too bad my employer isn’t really hiring now. I’m sure you would be able to just bring in a plate of goodies in place of a resume to the interview, and the job would probably be yours. I made these a few weeks ago – I actually thought I had blogged about them, but I can’t find it, so maybe not. I tried baking a few immediately, leaving the batter overnight (12 hours old), and leaving it another 24 hours (36 hours old). I thought the cookies were equally good at all baking points, though they did get a little deeper/more caramely with age. They were delicious! We don’t have any cake flour in Spain, and bread flour is not easy to find. Could I substitute them for standard flour? Oh, and thanks for another great recipe! You can never go wrong with chocolate chip cookies! I used a recipe similar to this the other day and they were the best ever!! The salt really does make a huge difference! It was the perfect balance of sweet and salty. I want them again now…. i keep hearing about how amazing these cookies are, but you have photographic evidence to back you up. those have the perfect texture – i just want to bite into them! Thanks Anne, they really are spectacular! Yay, someone else who loves to cook but doesn’t like dark chocolate. I always substiture milk chocolate in recipes calling for semi sweet. These have become my holiday gifts for 90% of the people I am giving gifts to. They are AMAZING!!! I really have no words for them. I just made these this weekend, and it works well with a variety of flours. Because of a chronic flour shortage, I used some whole wheat flour and some whole wheat pastry flour and some Belgian dark chocolate chips (definitely smaller than feves). They are really good! Hi I’m just wondering whether these or the other chocolate chip cookies are better? 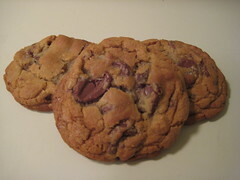 because in your big fat chewy cookie recipe, you mentioned that your favourite ones were the latter. These are the best, hands down. Thanks, I’ll try it out.